Definition at line 41 of file ctx.h. Definition at line 22 of file ctx.h. Definition at line 46 of file ctx.h. Definition at line 48 of file ctx.h. Definition at line 179 of file ctx_c.c. Definition at line 130 of file ctx_c.c. Definition at line 76 of file ctx_c.c. Referenced by hello_CtxOpen(), and main(). Definition at line 371 of file irotp.c. Definition at line 62 of file rpcserver.c. Definition at line 62 of file server.c. 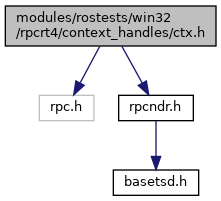 Referenced by hello_CtxClose(), and hello_CtxOpen(). Definition at line 54 of file ctx_c.c. Referenced by ATSVC_HANDLE_bind(), ATSVC_HANDLE_unbind(), BROWSER_IDENTIFY_HANDLE_bind(), BROWSER_IDENTIFY_HANDLE_unbind(), client_free_handle(), CtxOpen(), DsRoleGetPrimaryDomainInformation(), DsRolerGetPrimaryDomainInformation(), DsSetupBind(), DsSetupUnbind(), EVENTLOG_HANDLE_A_bind(), EVENTLOG_HANDLE_A_unbind(), EVENTLOG_HANDLE_W_bind(), EVENTLOG_HANDLE_W_unbind(), LOGONSRV_HANDLE_bind(), LOGONSRV_HANDLE_unbind(), m_CtxOpen(), m_CtxOpen2(), main(), ndr_client_call(), ndr_update_context_handle(), NDRCContextUnmarshall(), NDRSContextMarshall2(), NDRSContextMarshallEx(), NDRSContextUnmarshall2(), NDRSContextUnmarshallEx(), PLSAPR_SERVER_NAME_bind(), PLSAPR_SERVER_NAME_unbind(), PNP_AddID(), PNP_Connect(), PNP_DeleteClassKey(), PNP_DeviceInstanceAction(), PNP_Disconnect(), PNP_EnumerateSubKeys(), PNP_GetClassCount(), PNP_GetClassName(), PNP_GetClassRegProp(), PNP_GetCustomDevProp(), PNP_GetDepth(), PNP_GetDeviceListSize(), PNP_GetDeviceRegProp(), PNP_GetDeviceStatus(), PNP_GetGlobalState(), PNP_GetHwProfInfo(), PNP_GetInterfaceDeviceList(), PNP_GetInterfaceDeviceListSize(), PNP_GetRelatedDeviceInstance(), PNP_GetRootDeviceInstance(), PNP_GetServerSideDeviceInstallFlags(), PNP_GetVersion(), PNP_GetVersionInternal(), PNP_HwProfFlags(), PNP_InitDetection(), PNP_IsDockStationPresent(), PNP_RegisterNotification(), PNP_ReportLogOn(), PNP_SetClassRegProp(), PNP_SetDeviceRegProp(), PNP_UnregisterNotification(), PNP_ValidateDeviceInstance(), PREGISTRY_SERVER_NAME_bind(), PREGISTRY_SERVER_NAME_unbind(), PSAMPR_SERVER_NAME_bind(), PSAMPR_SERVER_NAME_unbind(), SRVSVC_HANDLE_bind(), SRVSVC_HANDLE_unbind(), SVCCTL_HANDLEA_bind(), SVCCTL_HANDLEA_unbind(), SVCCTL_HANDLEW_bind(), SVCCTL_HANDLEW_unbind(), WINSPOOL_HANDLE_bind(), WINSPOOL_HANDLE_unbind(), WKSSVC_IDENTIFY_HANDLE_bind(), WKSSVC_IDENTIFY_HANDLE_unbind(), WKSSVC_IMPERSONATE_HANDLE_bind(), WKSSVC_IMPERSONATE_HANDLE_unbind(), WLANSVC_HANDLE_bind(), and WLANSVC_HANDLE_unbind(). Definition at line 69 of file ctx_c.c. Definition at line 61 of file ctx_s.c.